More Nokia GPS handsets on the way? Will the Nokia/Navteq deal mean more GPS-enabled phones such as the Nokia N95? Nokia today announced that it has snapped up route-mapping firm Navteq. The two firms said their coming together would create a "leading global player in the fast growing location based services market". The collaboration is likely to mean more GPS-equipped mobile handsets from Nokia in the near future. Navteq provides digital map information for car navigation systems, portable navigation devices, web-based mapping applications, and government and business solutions. It supplies maps to a number of other satnav makers, including Garmin and Magellan - who may well have to pay Nokia to retain use of Navteq's maps. It's the same situation for Mio and Navman who use maps from TeleAtlas, a company that's now owned by rival TomTom. Navteq's knowledge should be useful for Nokia. 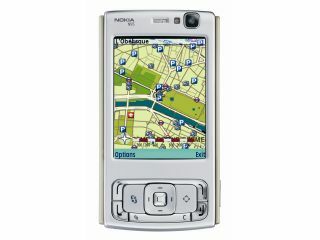 It has recently expanded its Nokia Maps service, which is preloaded in the GPS-enabled Nokia N95 handset. "Location-based services are one of the cornerstones of Nokia's internet services strategy. The acquisition of Navteq is another step toward Nokia becoming a leading player in this space," Olli-Pekka Kallasvuo, president and CEO at Nokia, said in a statement.